Mary Kieh, photographed at her home in Yeadon, Delaware County, is a mother of four and a nurse at Mercy Fitzgerald Hospital in Darby. 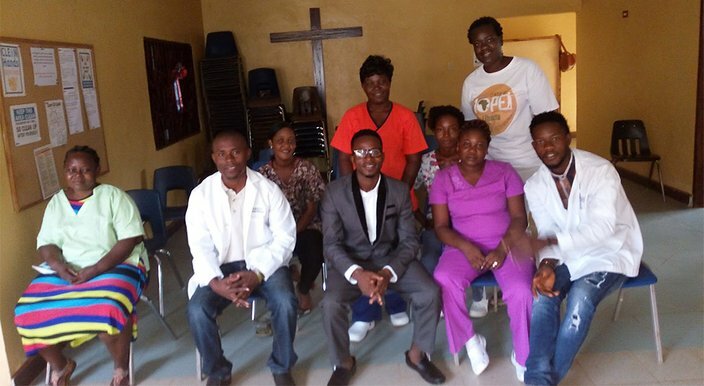 She built her own health care center more than 4,000 miles away – in Johnsonville, Liberia. Mary Kieh finally has her living room and dining room back. There is floor space she hasn’t seen in years. No longer must she look down and twist her way through parts of her Yeadon, Delaware County home. The assortment of taped-up cardboard boxes and plastic containers that once filled her house is now gone, sent halfway across the world to fulfill an idea six years ago that blossomed into reality. The nurse at Mercy Fitzgerald Hospital in Darby built her own hospital more than 4,000 miles away – in her former homeland in West Africa. The new and donated medical equipment, which once piled up in her corner twin home, now services 300,000 people in Johnsonville, on the rural outskirts of Monrovia, the capital city of Liberia. Kieh’s dream, the Robert Moore Memorial Health Care Center, opened its doors on January 25. It was dedicated to her brother Robert, who died in 2011 after complications from a limb amputation. Nearly 300 people from the local community bunched up under a tent for the grand opening, attended by Dr. Yatta Sackie Wapoe, the Montserrado County health officer, and a multitude of smiling faces. So far, the center has seen 186 patients in its first two months. Kieh's seemingly impossible mission to help people in her former homeland was the result of years of steadfast work and the support of her husband, Mark, an infectious-diseases physician conducting research on the Ebola virus which threatened the country's political and economic stability in recent years. They came to the United States in 1998 from Liberia and have U.S. citizenship. “I was nervous driving there the first day we opened, because the opening was a big deal,” Mary Kieh admitted. “First, you have a plan and a vision, and a few years later, you’re buying cement for the foundation, and then buying an ambulance on eBay. Then, you start to think that this really is going to happen. It seemed like someone else was doing this, and I was just watching. 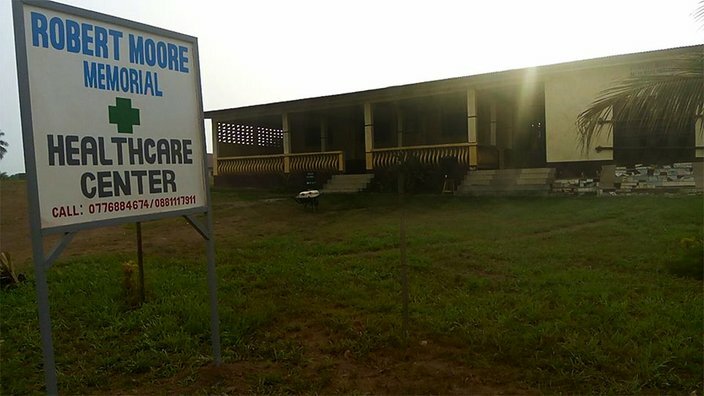 The Robert Moore Memorial Healthcare Center opened January 25 in Johnsonville, on the outskirts of the capital city of Monrovia. It serves a community of 300,000. By the time civil war ended in Liberia in 2003, 95 percent of its health care facilities had been destroyed, according to the United Nations. The government, historically plagued by widespread corruption, spent just US$22 on health care per capita in 2009, according to World Bank data. The country of nearly 4.3 million today imports almost all of its staple food, rice, and is extremely vulnerable to food shortages. Liberia had only one doctor and 27 nurses per 100,000 people in 2009, according to a World Health Organization health profile. Highly communicable diseases – tuberculosis, malaria and diarrheal diseases – are widespread. HIV/AIDS represented 5.6 percent of all deaths in 2012. In 2013, just 61 percent of births were attended by skilled health staff, according to World Bank data. The maternal mortality ratio was 640 per 100,000 live births, according to WHO. Twenty-nine percent of all boys (and 26 percent of all girls) die before they turn 15. The health challenges are formidable, something Mary Kieh knew well. But she knew something had to be done. There were multitudes of Liberians who needed medical care. So she collected used EKG machines, bed pans, sinks, bandages, recliner chairs, recliner beds, stretchers – anything she could get her hands on — with help from Mercy Fitzgerald. She found the location and built the medical center. She hired a staff of 13, including two physician assistants, two midwives and three volunteers. So far they have had two births – a pair of baby boys – and are trying to provide care to as many pregnant women as possible. But there continue to be significant obstacles, Kieh said. For one, there is no running water in large areas of Johnsonville. Two gasoline-powered generators provide electricity, but the fuel is at such a premium in Liberia, the center can only open from 8 a.m. to 5 p.m.
“Liberia is a very poor nation and I want to be open 24 hours, but we can’t because we don’t have access to electricity,” Kieh said. “The first month we were up, everything came out of pocket." The Kiehs have spent tens of thousands of dollars on the project. Mary Kieh, standing in the white shirt, and her staff pose for a group photo at the Robert Moore Memorial Healthcare Center. 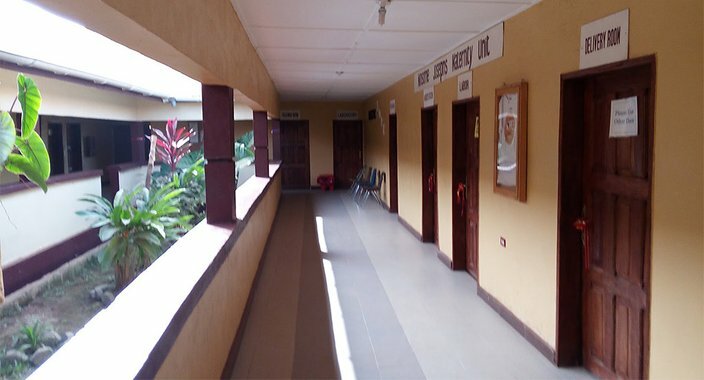 The hospital has a staff of 13, including two physician assistants and two midwives. During a visit to the country in December, Kieh decided the center would open in January. Another hindrance is that patients have difficulty paying for their treatment. The center charges a $3.50 registration fee for adults. For pediatrics, there is a $1.50 fee; revisits are $1 for children and $2.50 for adults. But a low estimate of Johnsonville’s unemployment rate is 75 to 80 percent. About 99 percent of families in the area lack modern amenities (indoor plumbing and electricity, for example) in their homes. The main source of income is petty trade and market sales. The locals had the misconception that the center was funded by the American government, or the Liberian government. It’s an area of battered zinc shacks, with corrugated roofs and dirt floors. Everything Americans take for granted is labor-intensive there. Going to the bathroom means filling a large bucket of water outside and lugging it inside to fill the toilet bowl, if they're fortunate enough to have an indoor toilet. “We have to charge something to keep the doors open,” Kieh said. “We have a staff to pay and fuel to buy to keep the generators running. You think building the structure is the hardest part, then you come to the realization that you have to worry about supplies and equipment and electricity, little things we take for granted in the United States. 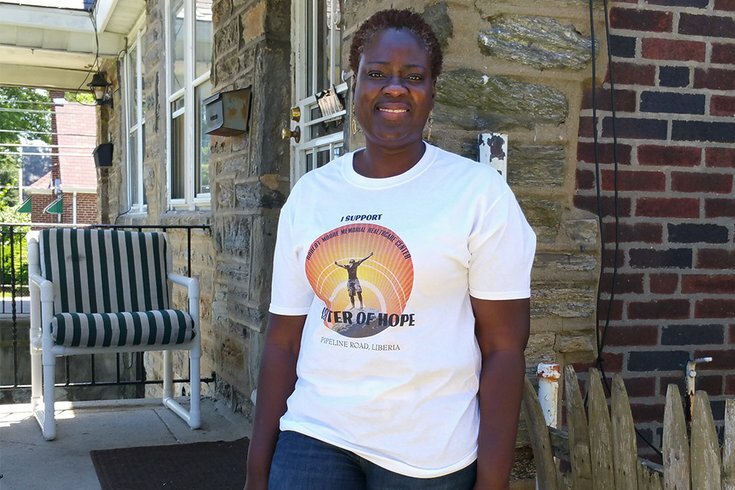 Mary Kieh is raising funds for her health care clinic in Liberia on GoFundMe.com. She has raised about $3,600 of her $20,000 goal. If you would like to make a donation, go here. “We need an incinerator right now to dispose of our medical waste. How do we do that? We have to build our own incinerator," she continued. There's also an ambulance to register. And a garage roof to be replaced after it was blown off in a storm. Still, about 40 percent have come through the doors of Kieh’s medical facility without paying, she estimates. She’s had to outsource the laboratory. Two baby boys have been delivered by the staff at the maternity unit since the hospital opened in late January. Trust is another factor in the facility’s progress. Many Liberians migrated to the United States when civil war ravaged the country from 1989 to 2003, taking more than 600,000 lives. In that exodus were many health care workers. Some returned to the West African country, but by then were “Americanized,” wearing a regal bearing as if above the plight of their native land. “That’s not my mom; she cares so much about the people and she understands the fight,” said Mark Kieh, 26, Mary’s oldest son. With a biology degree from Lock Haven University, he intends to obtain his Ph.D. in pathology and go back to Liberia. “My mother always said that no matter what you have, you have to share with others. I am very proud of her," he said. "My mom put her hands in the soil and did this with hard work. I remember starting from the very beginning, I saw the drive and the vision, but didn’t understand what the work was going forward. I was a little pessimistic at first. “I wasn’t on the same level where my mom was, but then you start seeing the house filled with donations. We couldn’t move around comfortably. Then you see the (Johnsonville) community come together around the medical facility and see what it means to the people living there," he recalled. "After I landed in Liberia, driving to our house there, I saw kids sitting in trash and it was like one of those Feed the Children commercials. This was real; kids walking through heaps of trash. It’s real poverty. They had nothing. “Now that there is a center, it’s a center of hope. They can’t afford health care. After seeing that, everything we went through here at home was minuscule compared to what the people in that community of Liberia go through. 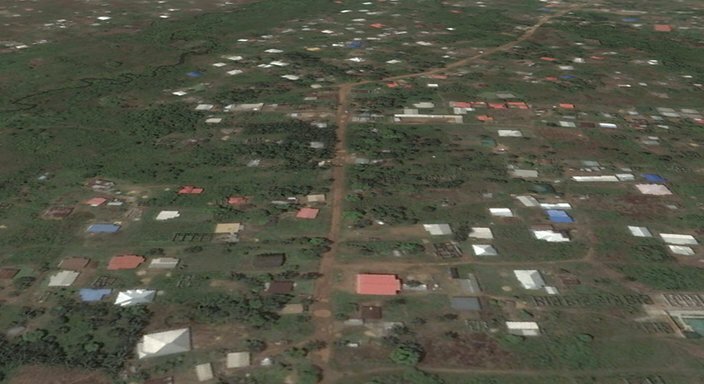 Johnsonville, Liberia is an area of battered zinc shacks, with corrugated roofs and dirt floors and an unemployment rate of about 75 percent. By the time civil war ended in Liberia in 2003, 95 percent of its health care facilities had been destroyed. A girl about the age of 15 was brought to Kieh’s clinic on a motorbike, the main mode of transportation in Liberia. She was lying across her sister’s lap. Mary and an aide rushed out to meet her. The sick girl had a gaunt, ghostly appearance. Mary grabbed her wrist. No pulse. The girl’s sister explained that her sibling had recently felt ill, though went to school the previous day. “You could tell that the girl was dead,” she recalled, a tremble of emotion in her voice. “They wanted to take her someplace else, but why put the family through that? I got a stethoscope and told them that the girl wasn’t alive. That’s the thing. They procrastinate and this is what happens. They had to go home. The girl’s older sister was crying. “I think we’re on the right track. The decision was made to help the people of Liberia and that’s good." But the unwavering commitment to help the people of her former homeland has weighed on this parent. "The one thing that I still regret is that I’m a mother with four children. There were times when I left them to treat people in Liberia. That’s been the absolute hardest part for me," she said. "I want to be there when my children arrive home from school. It doesn’t matter how old they are, I’m still their mother.